Grapefruit are in season, and I was so happy to see them priced low at the market that I got a little carried away. Granted, a single grapefruit offers more than a full day’s worth of Vitamin C and 4 grams of fiber – all for around 100 calories – but still. When I lined up all of my cheerful yellow-skinned grapefruit on the counter, I wondered what the heck I was going to do with them all. Have no fear! 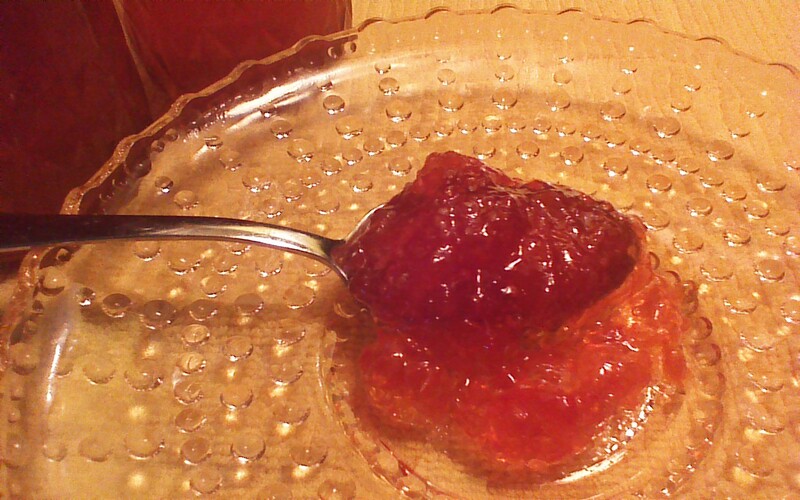 Grapefruit makes amazing jam – amazing! – and you’ve probably never even tried it, right? Today’s your day! All you need to create a few jars of sunrise colored, sweet-tart jam are four ingredients and a little bit of time. This jam is unique, pretty, and very affordable… excellent qualities for thoughtful gift giving! Have fun! 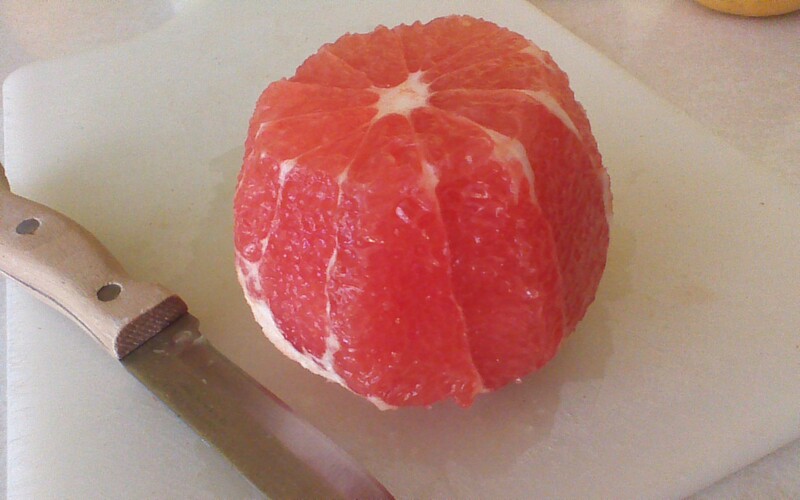 Step 1) First, we need to section the grapefruit so that we can use the pulp and juice, but not the membranes (in other words, all of the pink, none of the white). This isn’t difficult, but it will take a few minutes. Start by cutting the top and bottom half inch off, straight across. You should see pink. Then, use a paring knife to slice down the sides, removing the peel and all of the white, as shown. 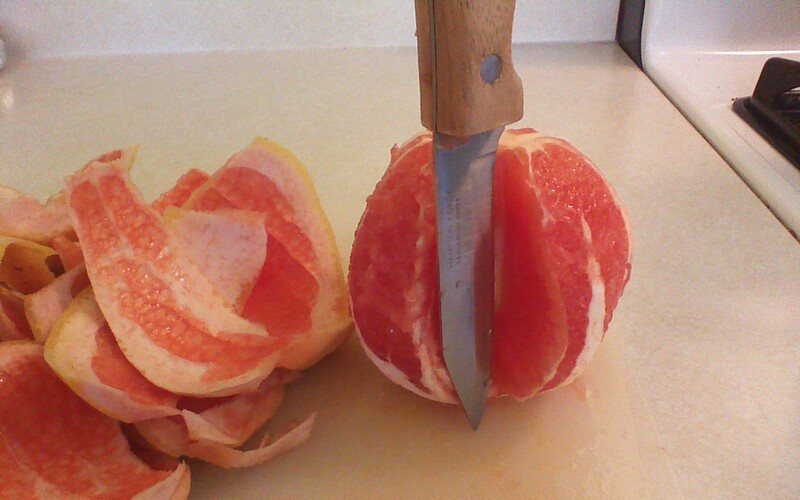 Step 2) Hold the grapefruit over a large cooking pot, so that you can capture all of the juice. Use a paring knife to carefully cut “V” shaped wedges inside of each membrane, removing all of the pulp. 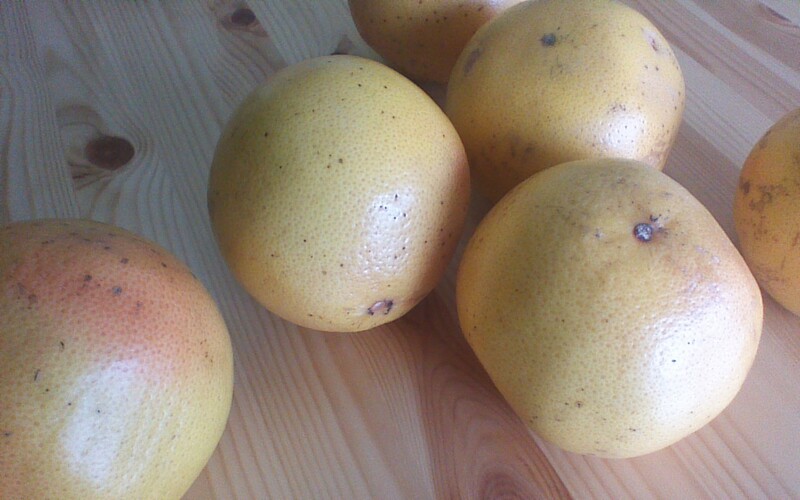 Repeat for all 6 grapefruit. This took me about 20 minutes. Be patient. This is the most time consuming step, I promise! 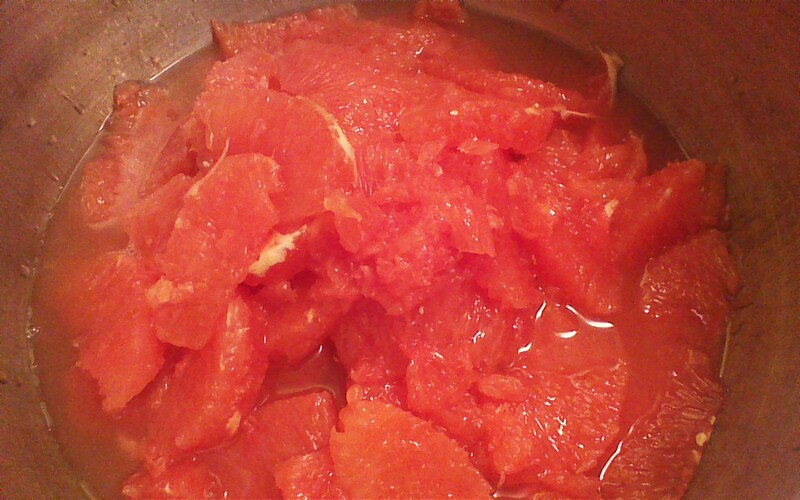 Step 3) Add 1/2 cup pomegranate juice to the pot with the grapefruit pulp and grapefruit juice. Bring to a boil, stirring frequently. Step 4) Sprinkle pectin over boiling fruit and stir in. Bring the pot back to a steady boil, stirring constantly. Pectin will burn if you don’t stir the pot. 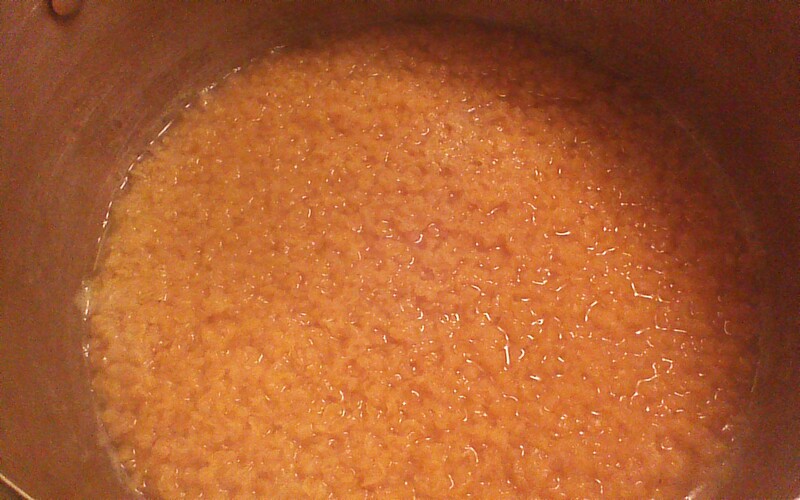 Step 5) When the pot is boiling again, add the sugar all at once. Stir. Continue stirring over medium-high heat until pot comes to a full, rolling boil. Boil for one minute (stir! ), then remove from heat. Step 6) Ladle jam into sterilized canning jars, cover with lids and bands, and process in a boiling water bath for 10 minutes. Enjoy your little jars of sunshine! It’s difficult to conjure up much enthusiasm in the produce section at the market this time of year. I’m tired of winter, not too thrilled about the slush and mud of early spring, and am ready to pick raspberries while wearing flip flops. While we wait for the market to burst with the flavors of summer, let’s enjoy one last hurrah with the sturdy fruits available in late winter. This simple fruit cocktail recipe will jazz up your breakfasts and lunchboxes, at least until those raspberries arrive. Step 1) Combine water and sugar in a saucepan. Bring to a low boil with occasional stirring, and remove from heat. Step 2) Combine all fruit in a large bowl. 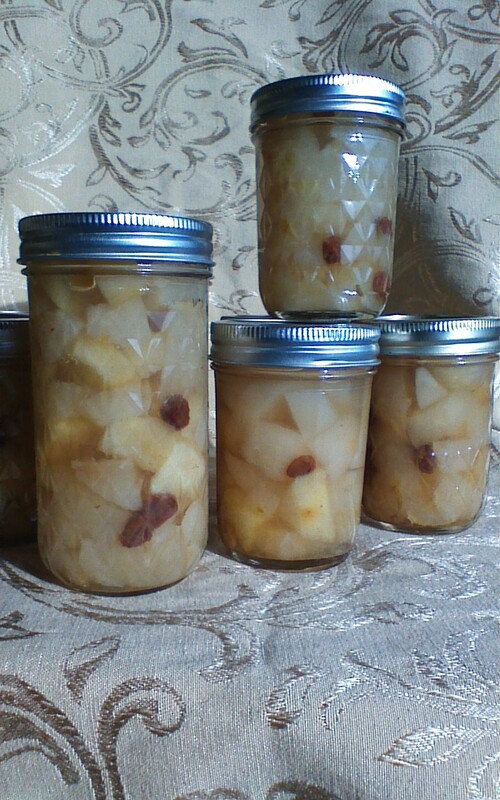 Step 3) Place 2 whole cloves, 2 whole allspice, 1 small cinnamon stick, and 1 tablespoon lemon juice in the bottom of each sterilized, pint size canning jar. Step 4) Pack each canning jar full to bottom of neck with fruit. Step 5) Fill each canning jar with water and sugar mixture, leaving 1/2 inch of headspace. Step 6) Poke out air bubbles and wipe rims of jars clean. Top with lids and bands. Process in a boiling water bath for 20 minutes. Step 7) Allow to cool, and check seals before storing. Enjoy! 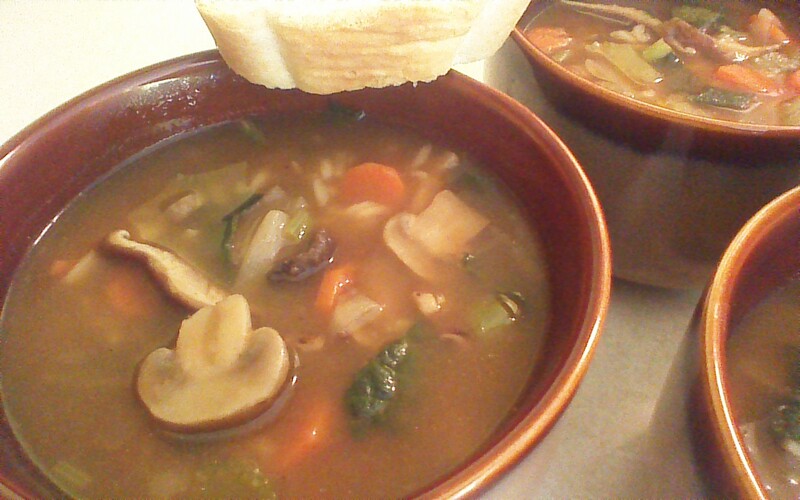 I adore the flavors and textures of many different mushroom soups. 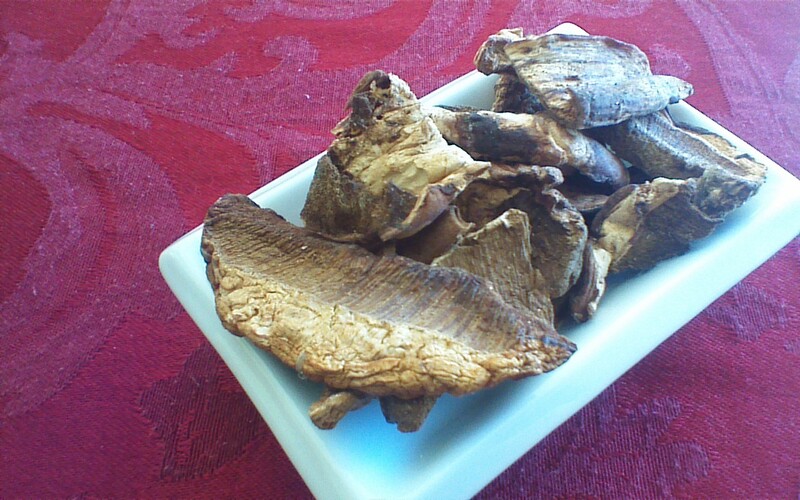 Unfortunately, many mushroom soup recipes contain an astonishing amount of animal fat in the form of cream, lard, and/or large quantities of butter. I’ll be honest – it took a while to create a heart healthy mushroom soup which still offered the velvety texture and depth of flavor I desired. But this… THIS is the recipe that captured what I wanted, while saying au revoir to most of that fat! A word of advice: Don’t skimp on the beef broth. Use the best beef broth you can get your hands on, such as the beef broth from our Soupe à l’oignon recipe, here. Trust me on this. Alternately, if you prefer not to include meat products in your cooking, you can easily convert this into a vegetarian recipe. Instead of beef broth, use a vegetable juice such as “v8.” Vegetable broth is too thin, both in viscosity and flavor, for this recipe. Step 1) Bring 4 cups of water to a boil in a large pot. Remove from heat. Add dried porcinis, cover, and soak for 15 minutes. Then, remove porcinis with a slotted spoon… leave the liquid in the pot! Chop the porcinis into bite size pieces and set them aside. Step 2) To the pot of liquid, add beef stock and peeled, cubed potatoes. Cook until potatoes are soft, about 10 minutes. Puree with an immersion blender. Step 3) While the potatoes are cooking, sauté 1/4 cup chopped onion in 2 teaspoons of butter. Step 4) To the pot of broth and pureed potatoes, add sautéed onions, skiitake mushrooms, button mushrooms, carrot, celery, kale, pepper, and undercooked brown rice. Simmer for 10 minutes, then remove from heat. Step 5) Stir in chopped porcinis and worchestershire sauce. Enjoy! FINAL March Madness Giveaway – Don’t Miss Out! 1) Follow Crowded Earth Kitchen on Twitter! 2) Share Crowded Earth Kitchen Facebook posts this week! Brilliantly written and genre defying, The Beekeeper’s Lament is a book that stays with you long after you reach the back cover. Hannah Nordhaus’s decorated journalistic background will come as no surprise to readers who find themselves absorbing careful research couched within well written and occasionally comic prose. While honey bees shine as main characters, their story is not told in a vacuum. Instead, Ms. Nordhaus tells the story of honey bees within the greater story of their ecosystem… we learn about the bees in such varied settings as the clover and alfalfa fields of North Dakota, the blueberries of Maine, almond trees of California, and winter storage destinations including Texas and Florida. Beekeeping. The story of the honey bees would be woefully incomplete without the stories of their keepers. In The Beekeeper’s Lament, Ms. Nordhaus gifts her readers with a comedic cross section of stories told by beekeeper. These stories range from accounts of beekeeping conventions to the recovery of stolen beehives to the rise and fall of a particularly inventive drug runner who kept his contraband hidden inside of active beehives. The real hero of the story, as the reader will soon discover, is John Miller, the beekeeper and email poet who opened his life to Hannah Nordhaus and his story to each of us. In the quest to educate ourselves about where our food comes from and how it was produced, The Beekeeper’s Lament is a valuable tool. This book will shape the way you think about the familiar buzzing sounds of summer. During a recent visit to my favorite food co-op, I spotted a ten pound bag of locally grown organic carrots. Then I discovered a smaller, three pound bag of squatty little yellow carrots, which I just had to try. The celeriac smelled wonderful, the parsnips felt fresh, and who can resist beautiful red beets? 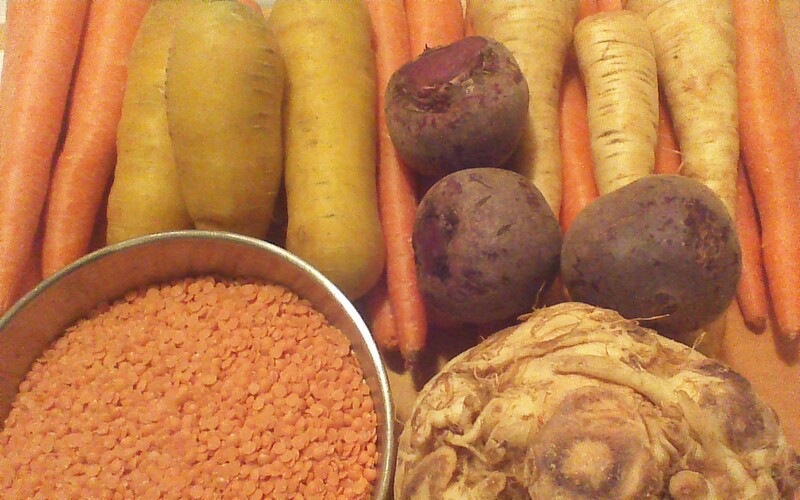 Before I realized what I had done, I was on my way out of the co-op with 20 pounds of root veggies. I don’t think it’s possible to have too many root vegetables. Root veggies are among the most economical ingredients available in the produce section of any market. They’re a versatile addition to many meals, and hearty enough to hold the starring role in a vegetarian or vegan dinner. Root vegetables are generally low in calories, are full of fiber, and offer up a host of antioxidants, essential minerals, and vitamins such as A, B complex, and C. Today, we will enjoy root vegetables two ways. 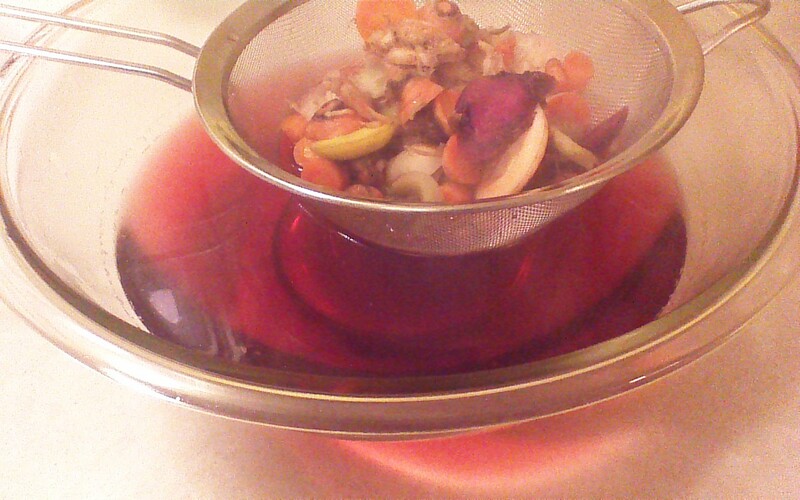 First, we will prepare a simple roasted root medley. Second, we will make broth from the peels, which will serve as the base for a delicious bisque. Waste not, want not! Step 1) Wash all root vegetables carefully, as we will be using the peels! 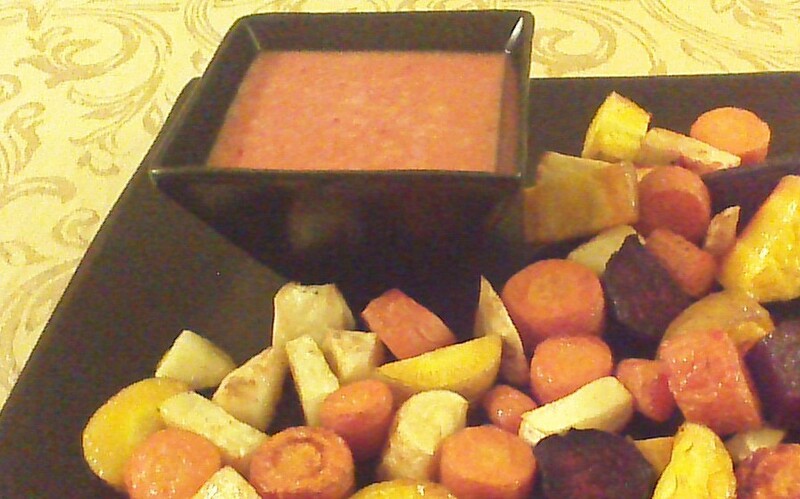 Step 2) Peel carrots, parsnips, and beets. Trim the “lumpy and bumpy” surface off of the celeriac, until you are left with what looks like a smooth, white beet. Step 3) Place all peels and trimmings in a pot with 4 cups of water. Bring to a boil. Reduce heat and simmer, covered, for one hour. Step 4) After one hour, strain broth through a sieve, and discard the peels into your compost bin. Step 5) Return broth to the pot and add lentils. Simmer until lentils are soft, about 20 minutes. Remove from heat. 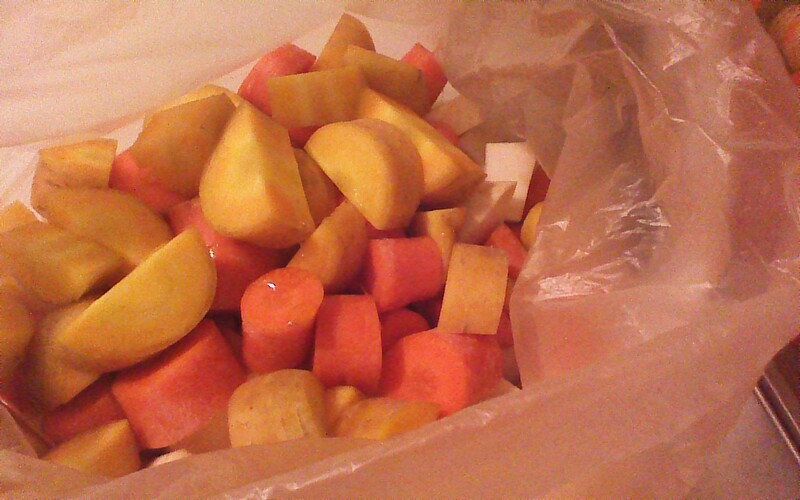 Step 6) While broth is simmering, cut all root vegetables into 1 inch chunks and place in a plastic bag. Drizzle 2 tablespoons of olive oil into the bag. Add a dash of salt and pepper. Carefully shake the bag to evenly coat the vegetables. Step 7) Use remaining 1 tablespoon of olive oil to grease a large baking pan. Spread vegetables onto the baking pan, and roast in a 400 degree oven for 30 – 40 minutes, or until slightly browned on the outside and soft on the inside. Stir after 20 minutes. 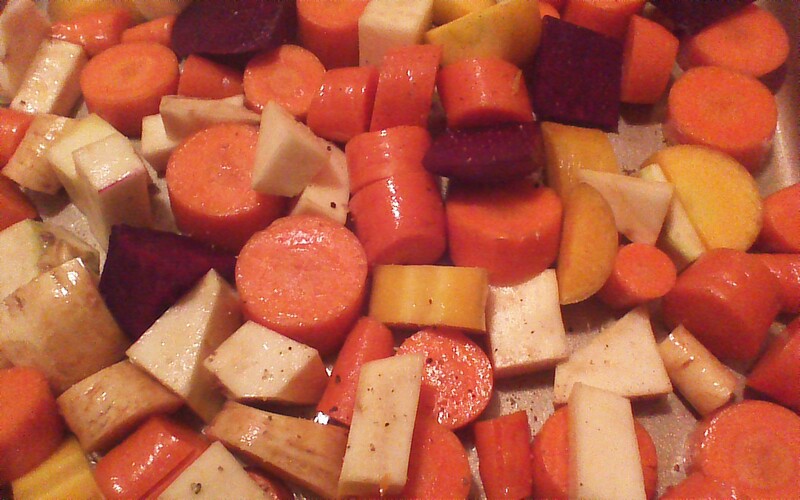 Step 8) Transfer 4 cups of roasted root vegetables to the pot with the broth and lentils. 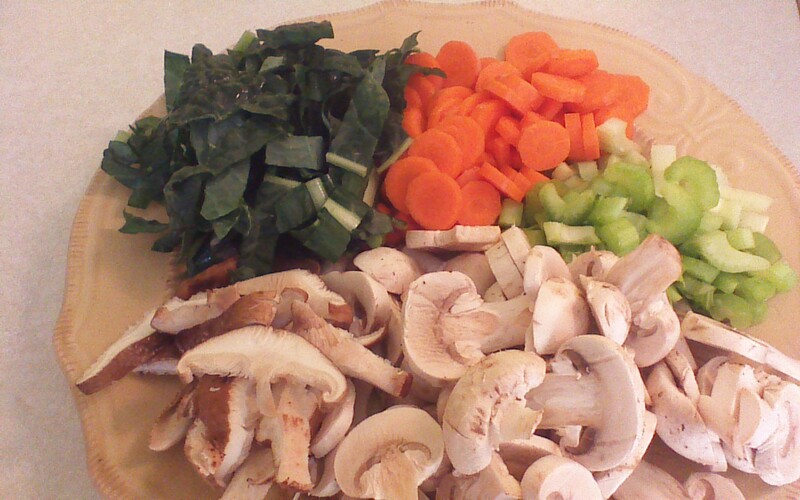 Arrange the remaining vegetables on a serving platter. 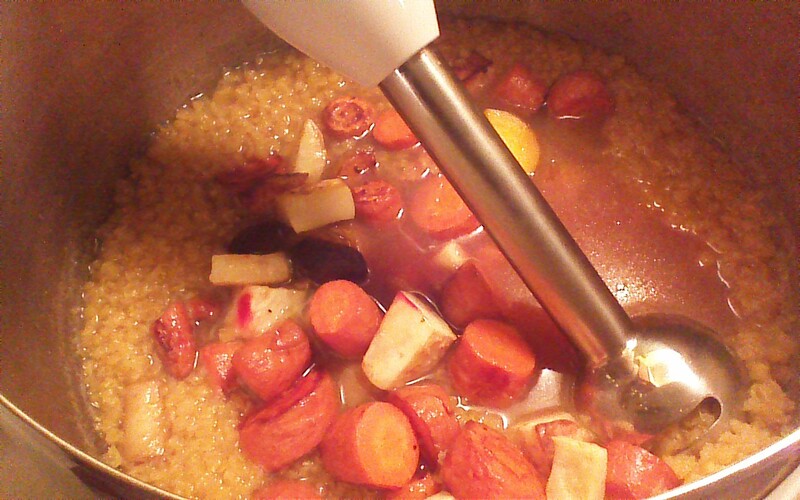 Step 9) Use an immersion blender to puree your pot of broth, lentils, and root vegetables. Season with salt-free seasoning blend and coarse ground black pepper. Enjoy! Write a Guest Post, Win a Book! Last Day – Write a Guest Post, Win a Book! How to Win: Agree to write a guest post to appear on Crowded Earth Kitchen! Simply post a comment below, and I’ll be in touch! I have books for THREE MORE READERS who post a comment below agreeing to submit a guest post! Wellness-minded recipe posts, stories of kitchen related collections, and food related book reviews are welcome. Posts should be between 300 – 600 words, and should include a picture. It would be easy for a casually concerned consumer to read the title of this book, think of the reusable shopping bags hanging by the door, and feel smug. In 168 pages, many of which include shocking full color photos, Dan Imhoff lays out the clear and compelling case that we have a long, long way to go before we can even begin to consider our global packaging waste problem solved. Appropriately published by Sierra Club Books, this 2005 text remains highly relevant for people who wish to really understand the scope and scale of the damage our current packaging habits are wreaking upon our planet. This book serves as an excellent resource for those who wish to really delve into the complex changes that will be necessary to facilitate environmental healing. As an educator, it strikes me that this would be a wonderful book for classroom use at the high school and college levels. The author does a brilliant job of back-loading a copious amount of research into hefty appendices and end notes; as a result, the text itself tells an important story without becoming dry, and is as easy to read as it is informative. In the first section, “The Packaging Landscape,” the reader is guided through an explanation of the sobering scope and scale of waste created by our tacit obsession with packaging (an average of 300 pounds of waste per person per year!). The second section, “The Search for Solutions,” walks us through an engaging set of case studies which range from high tech electronics companies to frozen confections. Promising research and development initiatives are explored, as are foreign legislative policies aimed at mitigating our global packaging waste crisis (not surprisingly, the United States lags woefully behind global leaders in this arena). The third section, “A Future Beyond the Box,” provides the reader with guidelines for distinguishing between bad wraps and better packaging. We are also provided with thirteen very clear, simply explained steps each of us can take to do our part to help solve this often overlooked global crisis. 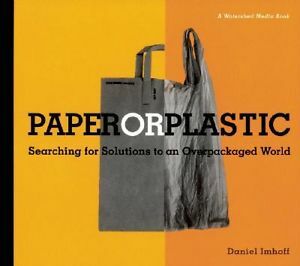 Paper Or Plastic: Searching For Solutions To An Overpackaged World is as well written as it is important. Each of us needs to read this book. I don’t follow a paleo diet myself, but I do try to maintain a welcoming kitchen. Whether you are paleo, gluten free, vegetarian, vegan, or a good ol’ meat-and-potatoes-with-a-slice-of-pie kind of diner, you will find something to enjoy at Crowded Earth Kitchen! These are for Heidi, but I’m sure she’ll share. They’re fast and easy, perfect when you need a high protein, not-too-sweet snack. 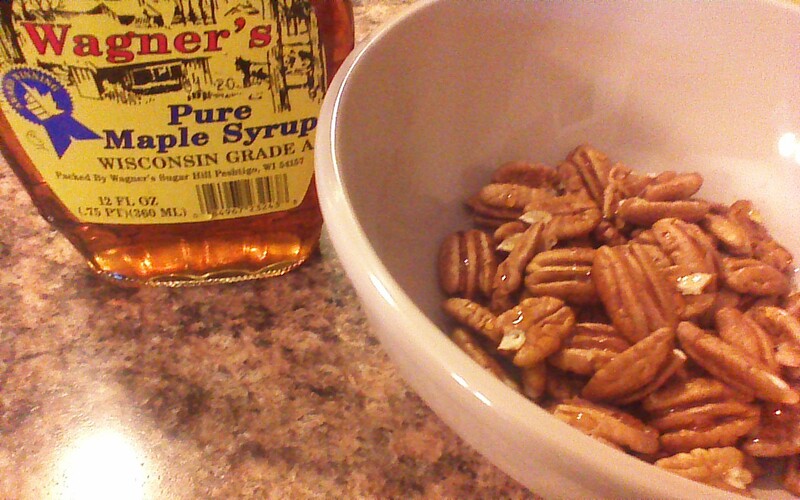 Step 1) Drizzle maple syrup over pecans in a small mixing bowl. Mix well to coat evenly. 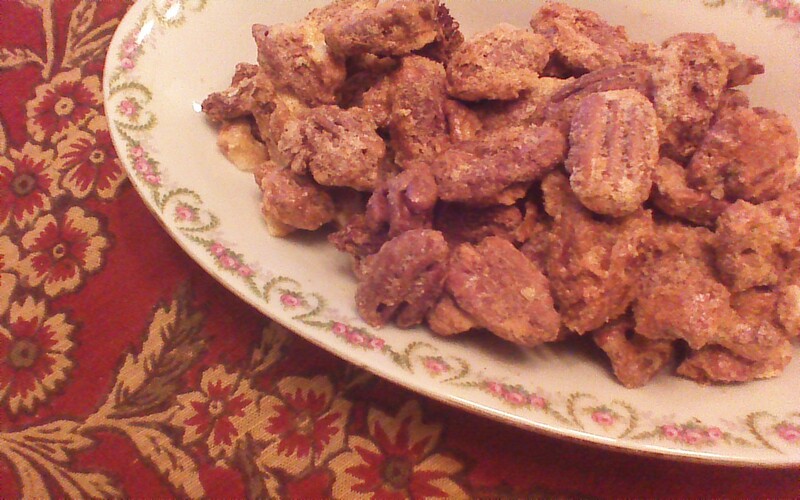 Step 2) Sprinkle cinnamon, nutmeg, and cardamom over pecans. Mix well to distribute spices. Step 3) In a scrupulously clean bowl, beat egg white (no yolk – not even a speck!) until soft peaks form. Step 4) Gently fold egg white into pecans. Gently! 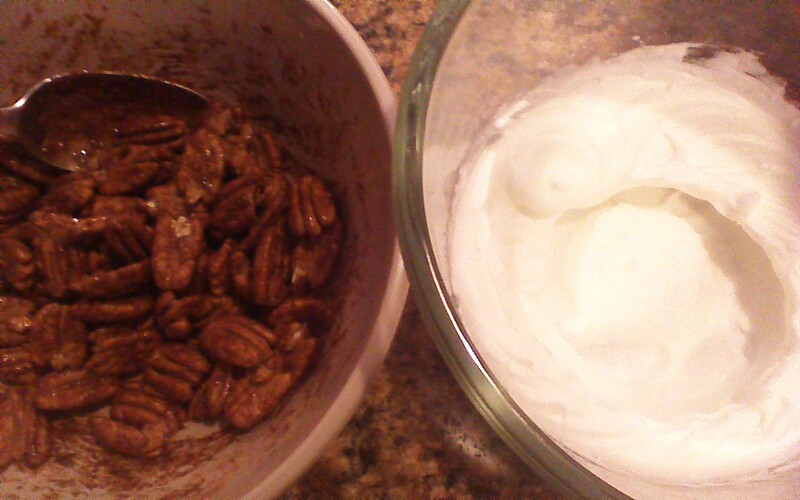 The idea is to coat the pecans with egg whites, while retaining their foamy appearance. If you stir too long, the beaten egg whites will collapse and liquefy. Boo. 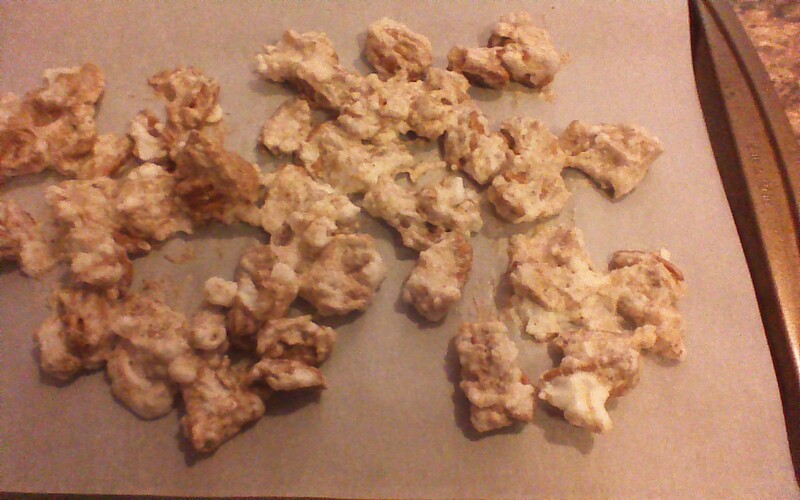 Step 5) Line a baking sheet with parchment paper, and spread the pecan mixture on the paper. Step 6) Bake pecan mixture in a preheated 300 degree oven for 30 minutes, stirring once. Let cool completely before storing in an airtight container. Step 7) Enjoy while watching The Flintstones. Just kidding.